Manvi Jain both from the Amity International School, Vasundhara, Sector 6, Ghaziabad were announced as winners at a ceremony held at the Swedish Ambassador’s residence. napkins. Manvi Jain was selected as a winner for Bees wax cloth wrap, which is reusable and bio-degradable and eliminates the use of foil papers and cling foil. EAT, MOVE and LIVE. 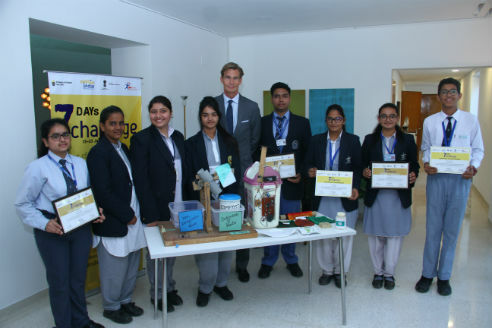 The event was organized by the Embassy of Sweden in partnership with TERI School of Advanced Studies and Eco-Club initiative of Department of Environment, Government of NCT of Delhi. The event was part of the Embassy’s 11th edition of The Sweden India Nobel Memorial Week. Thirteen hundred and thirty students participated from Delhi NCR and more than three hundred innovative ideas were received. Some of the other innovative ideas were Sustainable Development Mobile Application, Intelligent dustbin, Calcium from eggshells, Affordable slippers, Alarm in the mobile phones for completion on charging, Organic charcoal, Dustbin with a hemispherical top, Cars run on super conductors and Microfrost. The challenge aided in encouraging both innovation and awareness about lifestyle choices that contribute to sustainability not only for 7-day but beyond for a lifetime.